Can store 2 bikes comfortably. Or why not tidy away toys or garden equipment. Tongue & groove walls with OSB roof. No floor supplied. Full width double doors for easy access. 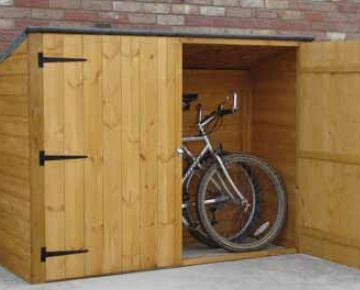 The Pent Bike Store is made from sturdy 12mm tongue and groove shiplap cladding, providing economic storage for up to 3 bicycles or can be used as a store for outdoor toys or other garden equipment. Large double doors provide easy access. It is provided without a floor to allow the bikes to drain harmlessly.